Chateau Bellevue in Saint Emilion is known to have great terroir. The ancient Romans were aware of this. In fact, when walking the vineyards, it’s easy to spot remains of the original plantings left by ancient Roman vintners. The rebirth Chateau Bellevue begins in the 17th century. At that time, the Fief de Bellevue, took charge of the vineyard As was the custom of the day, he renamed the Bordeaux vineyard using his name. The property remained in the hands of the same family from 1642 until Chateau Bellevue changed hands in 1938, when the vineyard was purchased by the de Coninck family along, with the Pradel de Lavaux family as a joint venture. Starting with the 2000 vintage at Chateau Bellevue, the dynamic duo of Bordeaux, Nicolas Thienpont and Stéphane Derenoncourt were hired to turn the estate around. That was the first vintage in ages showing how good Chateau Bellevue could be. In late 2007, a 50% stake in the 5.90 hectare vineyard of Chateau Bellevue was purchased by the de Bouard family, owners of Chateau Angelus, which is located almost adjacent to the property. Since the time, Hubert de Bouard began calling the shots. Once Hubert de Bouard took charge, he instituted top to bottom renovations for the wine making facilities, chateau and vineyards of Chateau Bellevue. The labels on the bottles were updated as well. This was to compliment the changes in the vineyards and chateau. Ironically, the de Bouard family had an opportunity to purchase the Right Bank property several decades earlier. But due to difficult economic conditions at the time, they did not buy it when it was first offered. 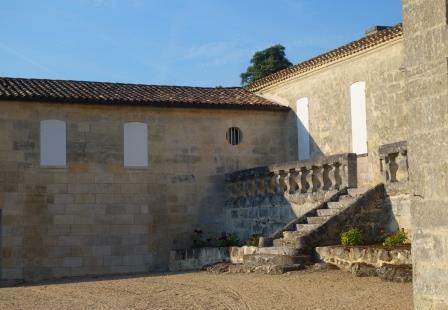 Following the recent acquisition of the property, a complete, top to bottom renovation of Chateau Bellevue took place in the Saint Emilion vineyards as well as in the cellars, reception area and wine making facilities. 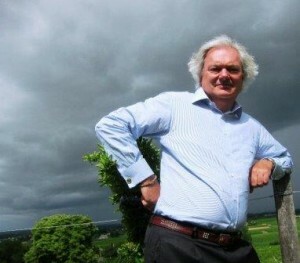 The de Bouard family own other estates in the Right Bank including; Chateau La Fleur de Bouard in Lalande de Pomerol, and Chateau de Francs in the Cotes de Francs appellation. Starting in 2012, Stephanie de Bouard-Rivoal, the daughter of Hubert de Bouard took over control of the estate. The 6 hectare vineyard of Chateau Bellevue is planted to 100% Merlot, Previously, there was a minor, 2% portion of the vineyard that was planted to Cabernet Franc. But those vines were ripped out in 2015. Interestingly, several years before that, the estate had even more Cabernet Franc planted in the vineyards. But those vines were also removed in favor of Merlot. The terroir is clay and limestone soils. The vineyard is on the plateau of a slope, next to Chateau Beausejour Duffau, with a south facing exposure. All the work in the vineyards has been done using 100% organic farming methods since 2006. They were certified organic in 2009. Chateau Bellevue is also located exactly across the road from Angelus. The vines are on average, 40 years of age. Chateau Bellevue is one of the few estates in Saint Emilion with 100% Merlot in their vineyard. Chateau Bellevue is also one of the oldest vineyards in the Right Bank. In fact, the ancient Roman ruins found throughout the soil, make it difficult to plant in some areas, as the remains are protected by law and cannot be disturbed. However, this makes it an amazing walk as your stroll through the vineyards of Chateau Bellevue, as the remains are easy to see scattered about in the soil. To get an even better understanding of their terroir, visit the limestone caves located under the chateau. Hubert de Bouard refers to the estate as the Petrus of St. Emilion, due to its high concentration of Merlot. Chateau Bellevue is a labor intensive wine to make. After the fruit is hand harvested from their Saint Emilion vineyards, the grapes are taken to the reception area and placed on four sorting tables. Vinification of Chateau Bellevue takes place in a combination of cement and oak tanks. Each block is fermented separately. In 2009, for the first time, 40% of the wine was micro-vinified, meaning that those grapes were fermented in barrel. Malolactic fermentation takes place in 100% new, French oak. The wine of Chateau Bellevue is aged in 100% new, French oak barrels. Sur lies aging takes place in barrel for the first six months of the aging process. Chateau Bellevue produces on average about 1,500 cases of wine per year. There is a second wine, La Caze Bellevue. Chateau Bellevue is better with at least 8-10 years of aging in good vintages. Young vintages can be decanted for 1-2 hours, or more. This allows the wine to soften and open its perfume. Older vintages might need very little decanting, just enough to remove the sediment. Chateau Bellevue offers its best drinking and should reach peak maturity between 9-22 years of age after the vintage. Chateau Bellevue is best served at 15.5 degrees Celsius, 60 degrees Fahrenheit. The cool, almost cellar temperature gives the wine more freshness and lift. Chateau Bellevue is best served with all types of classic meat dishes, veal, pork, beef, lamb, duck, game, roast chicken, roasted, braised and grilled dishes. Chateau Bellevue is a perfect match with Asian dishes, hearty fish courses like tuna, mushrooms and pasta as well as cheese. Satiny, sumptuous, ripe, medium/full bodied with heaps of sweet, dark plums, chocolate, licorice and wet earth, there is a softness to the tannins that engages perfectly with the delectable fruits. This wine is made from 100% Merlot. Deep in color, this blend of 100% Merlot is all about the rich, silky textures, polished tannins, freshness, and the ripe, plush, plummy, mineral-driven finish with that touch of dark chocolate, spice and earth in the endnote. This could be the best ever wine from Bellevue. The essence of a mineral-driven wine, with salty tannins, fresh, dark, plums, juicy, black cherry, anise and chocolate, this wine is silky, crisp and fresh. The wine was made from 100% Merlot. Peppery, spicy, herbs and cherries open to a soft, forward, medium bodied, easy to drink, fresh, Merlot dominated, soft, chocolate, plummy wine. Chocolate covered black raspberries, smoke, licorice and espresso notes open to a medium bodied, fresh, black cherry, plum and mineral driven wine. Juicy ripe plums, coffee bean, licorice and earthy notes pair perfectly with the round textures, sensation of minerality and the plush, black cherry and cocoa filled finish. Coffee bean, licorice, blackberry, smoke, stone and chocolate scents create the perfume. Lush, round and soft in texture, the wine ends with a blast of licorice, cocoa and black cherries. Licorice, truffle, smoke, earth and blackberry jam scents open to a rich, soft, low acid St. Emilion with freshness, stone and deep, ripe berries. With jam, coffee, stone and ripe black and blue fruit scents, this soft, round and opulently textured wine shows a touch of heat in the sweet, fruit filled finish. The wine has firmed up over the past 12 months and is currently a bit tight. It requires effort and air to open and find its licorice, black cherry and crushed stone driven qualities. I'd let it sleep for at least 5 more years before popping a bottle. Just starting to show its lushly textured, black cherry, plum, licorice, smoke, espresso and wet earth character. The tannins is soft, the fruit is sweet fresh and ripe, finishing with supple textured, dark red fruits, chocolate and cocoa. Medium bodied, elegant, supple, fresh and fruity, the texture was on the silky side, which I really liked. Not much density, but the sweetness and purity in the fruit was a pleasure. Fully mature, this is not a wine to hold for further development. Better on the nose, with its earthy, thyme and cherry profile, than on the crisp, tannic, red berry and olive palate. Smoke, mocha, herbs, plums, cherries, licorice and wild herbs create the nose. On the palate, the wine is soft, medium bodied and elegant, with a dark chocolate and fresh plum finish. Splash decanted and poured, this is drinking at its peak. The wine softened in the glass after an hour or so, but it did not gain additional complexities and does not warrant further aging. I'd drink any remaining bottles over the next decade. Filled with black raspberry, ripe plum, fresh herbs and crushed stone aromatics. Soft, supple, fresh and filled with perfectly ripe dark fruit, this is developing nicely. Very smoky, with a rustic leaning, yet there was a lot of charm here in the remaining vestiges of bright, crisp, floral oriented, red plums. For a wine of this age, not so bad.